Tomorrow is the first day of my 12th year as an educator. I am so excited to have our halls filled with little people (and not-so-little as the Middle School case may be.) I enjoyed our time last week as teachers returned for meetings and preparations; it was a blessing to renew friendships and start to build ideas for our new year. However, the school is not the school without the children. The children are our purpose. They are the reason we became educators and they complete us. I often become nostalgic as the first day of school approaches. I remember my first day of school in first grade, ninth grade, and undergraduate school down to the clothes I was wearing. I’m not sure why these three grades stuck out to me, but perhaps it is because they represent new beginnings, particularly in ninth and college. In school, we have this great gift of summer to relax, renew, and wipe fresh the mistakes of the year before and courageously embrace the year to come. I see this as a grand opportunity, to try new things, to build new relationships, and to boldly encourage our students (and faculty) in exciting ways. 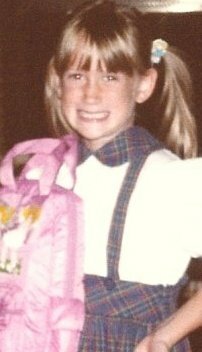 So I think back to Sarah, age 6, headed to first grade with her pigtails and Cabbage Patch Kid backpack, so full of anticipation and eagerness for learning. It is this person of yesteryear who comes out in me every Tuesday after Labor Day. Oh what adventures behold us for this new year. It is time to take hold and with courage being anew. Have a great year colleagues.